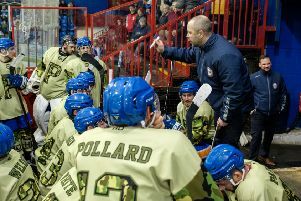 Phantoms coach Slava Koulikov admits the club’s casualty list has shrunk at just the right time. The city club have battled against injuries throughout the current English Premier League campaign. But there is finally light at the end of the tunnel with Australian forward Wehebe Darge the only man now sidelined – and he is expected back this Saturday when Phantoms travel to Hull (6pm). Netminder Janis Auzins (groin), defenceman Scott Robson (concussion) and captain James Ferrara (eye) all returned for a 4-1 home defeat at the hands of reigning champions Basingstoke last Sunday, with another blue-liner, Ben Russell, coming back from a spell out with concussion the previous weekend. Koulikov said: “The injuries have made life very tough for us for most of the season. “There were times when it felt like we were losing guys in every game, but we kept battling on. “I’m glad we’ve got the vast majority of the guys back. Now the challenge is making sure we get them into game-shape in time for the big nights we have ahead. Phantoms only have three games remaining in the regular season as they bid to nail down a third-place finish. The first of those is at Hull and Koulikov is keen for his men to boost their poor record at that particular venue. “They’ve been beaten 3-0 and 6-3 in their previous visits this season. Two fixtures against Guildford – away on March 11 and at home on March 19 – then follow. They sit 24 hours before and 24 hours after the two legs of the club’s EPL Cup final against Milton Keynes. Koulikov added: “Beating Basingstoke would have pretty much wrapped up third place, but we couldn’t get the result. “I don’t think the scoreline did us justice after two periods, but the third one was frustrating. “We don’t like dropping points at home and it has happened too often lately. It’s something we’ve got to look at and work out how to break teams down. “If we win our three remaining games, we will finish third and that is the target. We will be at full tilt every time we hit the ice now. “Traditionally we don’t do well in Hull. We had some problems there last season when they were struggling, and we’ve lost both visits so far this season.